Owing to extraordinary happenings, such as, road traffic accidents, major road works, buses have to find alternative ways of getting to their destinations. In May 1986 repairs were made to the railway viaduct between Wapses Lodge Roundabout and Woldingham Railway Station. 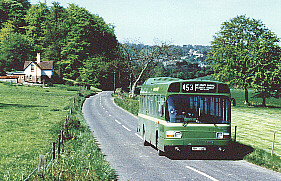 Route 453 was extensively diverted between these two points via, Whyteleafe, Warlingham, Chelsham Garage, Slines Oak Road and Slines New Road, this photo shows SNB 365 travelling along Slines New Road in the spring sunshine and passing Halliloo Farm which has now been transformed into The Woldingham Golf Club previously known of as Dukes Dene Golf Course. In October 1987 fallen trees across Harrow Road, Farleigh caused Route 403 to be diverted between Warlingham Park Hospital and Chelsham Garage via Chelsham Common and Chelsham Road. Please note the following diversion, which happened many years after the closure of Chelsham Garage. There were at least two recent occasions when I have personally escorted the driver of the Wednesdays only Route 411 running from Caterham to Tunbridge Wells via the country lanes around Woldingham, Slines Oak Road, Slines New Road, Woldingham and The Ridge to get round road accidents Worms Heath and Botley Hill on the B269.